YOU are the captain in this solitaire crew assignment game about surviving pirate-occupied space! 1,955 backers pledged $40,541 to help bring this project to life. You are the Captain of the new RPTR class starship on routine patrol of the Auborne system when a distress call was received. Upon warping in, you quickly realize it was a trap! With the help of your crew, you must survive until a rescue fleet appears. Deep Space D-6 is a solitaire dice game about surviving the cruel depths of outer space. Each turn you’ll roll Crew dice and assign them to stations aboard your starship. You must plan carefully to take care of internal and external threats to your ship. Survive to win. 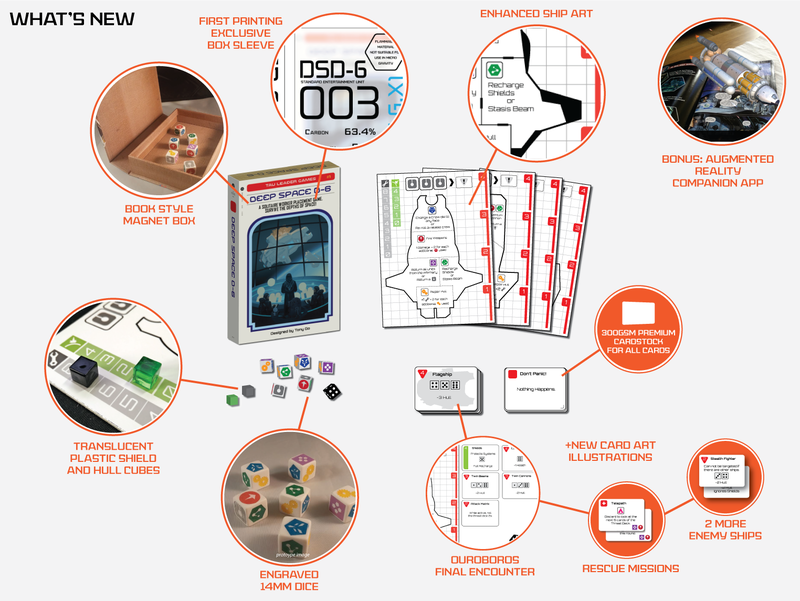 DSD-6 is a vintage styled board game with classic graphics and intuitive gameplay full of interesting decisions. As you progress through the game, you'll encounter internal and external threats that must be dealt with using the stations aboard your ship. How will you use your crew? Do you lock an enemy in stasis or recharge your shields? Will you risk sending a crew member to the infirmary to accomplish the task you need? Don't get reckless, a captain without crew is not a captain at all! Deep Space D-6 is a self-contained solitaire experience. Each copy includes everything you need to command your very own starship. Ready to play right out of the box! No assembly required. Deep Space D-6 includes 4 different starships with unique properties and station abilities. Which one will you fly? Learn more about the ships from Update #5. What's new from all the unlocked stretch goals? Have a look! Note: video and images only show the abilities of the first ship, The Halcyon. Check out the rules or try the game yourself with thePrint & Play. I've created a set of realistic stretch goals that will enhance and improve the game with low impact to the original design focus and estimated delivery time. UNLOCKED - $10,000 Hull Upgrade! The cardstock of the threat cards will be upgraded to a sturdy 300gsm. Fit for a Captain. UNLOCKED - $12,000 - Ships Detected! 2 more enemy ships will be added to the threat deck. UNLOCKED - $14,000 - We've Got Visuals! New illustrations will be added to the threat cards. UNLOCKED - $16,000 - Shiny! The wooden Hull and Shield cubes will be upgraded to plastic cubes. UNLOCKED - $18,000 - That's No Moon! If you somehow survive to the end, a thrilling multi-part Starship, The Ouroboros final battle awaits you. See the preview here. UNLOCKED - $20,000 - Rescue Missions! Rescue Missions are treated as Away Missions but are side quests that can be completed at your leisure. Once completed, a new single-use crew member becomes available to assist your survival. 2 Rescue Missions will be added to the deck. UNLOCKED - $22,500 - Magnets! To make Deep Space D-6 feel even more like a book, the box will be upgraded to a single-piece, high quality magnetic box. UNLOCKED - $25,000 - Crew Uniforms! This is the penultimate stretch goal: Engraved dice! UNLOCKED - $32,000 - Enhanced Ship Artwork! One last fresh coat of paint before we leave the hangar. Small design improvements to each ship will take us to the stars and back. UNLOCKED - 1,000 Backers Bonus Goal - Deep Space D-6 augmented reality app for Android/iOS exclusive to this Kickstarter. Use of the app is not required to play the game. The Egress Dice Upgrade Kit includes 6, 16mm Black anodized aluminum crew dice, a single 16mm Red aluminum threat die, an 8mm steel hull cube, and a special thank you note from me! $24 +shipping. Note: you will still receive all the standard components with this upgrade. Dragon's Ransom is now available in a limited double pack. This includes a full Kickstarter copy with the foil cover and backer's choice minion. Unfortunately, I do not have any more copies of Hunters of Arcfall so I am unable to offer that as an add-on. US Shipping is FREE, included in the basic $15 pledge. EU and Canada is +$5, Everywhere else is +$8. These amounts are added when you pledge. I ship games through fulfillment centers all over planet Earth. This reduces customs fees and VAT. The declared value will be the lowest figure I receive. Backers are limited to 3 total games per pledge. You may add up to 2 additional copies for $15 each by increasing your pledge by the appropriate amount. There is no extra shipping charge on these copies. Tau Leader Games is an indie game developer that consists of one person. This will be my third game published. I have had two successful Kickstarters in the past with Hunters of Arcfall and Dragon's Ransom. Deep Space D-6 does not fall in line with my previous two games. As such, I am trying something different. I want to be able to offer smaller, bite-sized games in between my bigger releases in order to maintain positive operating income. Deep Space D-6 is an experiment in minimal design in which I have completed the core art assets myself, lowering the art costs. Make no mistake, this is still a fully designed and tested gameplay experience. I am simply looking to diversify my game offerings. As with all my Kickstarters, you won't find crazy positive video reviews or extensive marketing campaigns with stretch goals where I try to maximize funding by over promising. As an independent publisher, I believe in investing in a solid product, and not my ability to convince you to back it- it's not a popular opinion, but it is one I think will have more long-term staying power in a post-Kickstarter environment. My last campaign, Dragon's Ransom, suffered from the dreaded late delivery common among many Kickstarters. I attribute this to using a distribution company for the first time. Since then, I have improved a lot regarding fulfillment and delivery. I am confident now Deep Space D-6 will be delivered in a timely fashion. The game is 80% complete and almost ready to be sent to my printers- only the new graphics and unlocked stretch goals need completion. I consider communication the most important part about setbacks and risks. You can be assured that you'll be kept in the loop if any issues arise. CADET - Are you doing your part? You'll get your name placed into the Thank You section of the Tau Leader Games webpage for DS D-6. CAPTAIN - The game. 1 copy of Deep Space D-6 shipped anywhere in the US. INT'L CPT - The game. 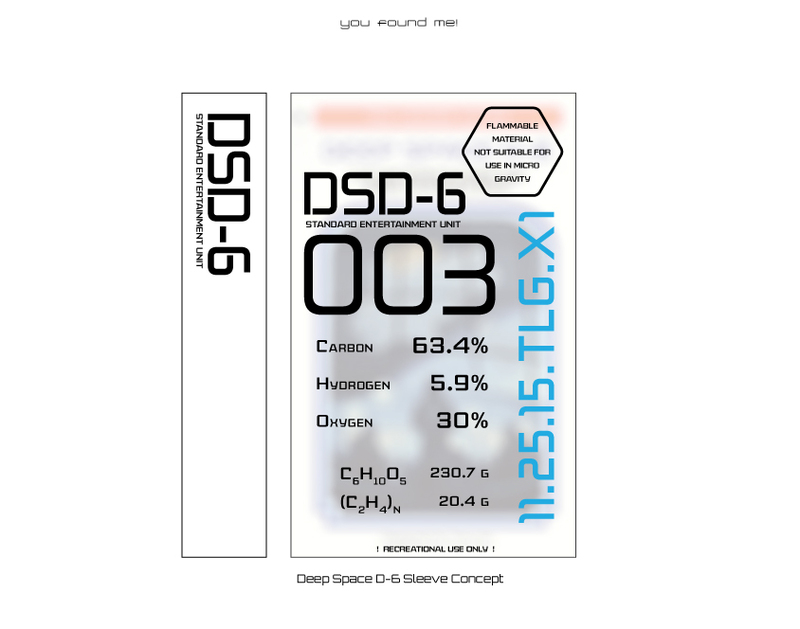 1 copy of Deep Space D-6 shipped outside of the US. Egress Edition - 1 copy of Deep Space D-6 plus the Egress Dice Upgrade Kit (see update #6). SQUADRON - 10 copies of Deep Space D-6 shipped anywhere in the world. TO INFINITY - The game. 1 copy of Deep Space D-6 sent into the edge of space via high altitude balloon flight. Also, 1 copy of Deep Space D-6 shipped anywhere in the world.